It’s been a while since we heard from Alvin Leung. The man behind three Michelin-starred Bo Innovation has been busy leading the celebrity chef life as a judge for MasterChef Canada and the host of Singapore TV’s Wok Stars. But with Bo Innovation now at home in bigger and better premises within Wan Chai’s J Senses complex, the Demon Chef has opened a new concept at the restaurant’s original location on Ship Street. 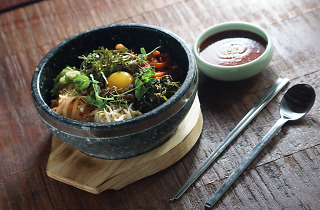 Teaming up with chef Yong Soo Do, previously the senior sous chef at Jinjuu and head chef of U-Hang, Leung has crafted the menu of a casual Korean eatery that also offers fabulous drinks – hence the name, Bib N Hops. Leung has helped put Hong Kong on the map as a hub of culinary creativity, gaining fame for marrying molecular techniques to nostalgic ingredients and local food products such as Pat Chun vinegar and salted egg yolk, so we’re curious as to how he and chef Yong interpret Korean classics. We’ve always lamented the underused terrace space outside the former Bo Innovation, as a casual tipple never gelled with the well-heeled atmosphere of a Michelin-starred institution. Now, the French windows are thrown open and you’re greeted with exposed brick walls and filament light bulbs. Elsewhere, the tiled mosaic of the Demon Chef in his famous power pose is replaced by an open bar facing the terrace. On the surface, there’s nothing too extraordinary on the menu apart from a few eponymous dishes which use a signature sauce or marinade. We start with a yukhoe ($158), a raw beef dish similar to steak tartare, which is interestingly topped with a pear sorbet. Such a dish is commonly served cold and the addition of a sweet, icy treat works great until the other condiments – parmesan and truffle aioli – get in the way. The salty flavours are too strong and win the contest with the more delicate notes of pear and beef. This is a shaky start. Fortunately, the rest of the meal picks up from here. 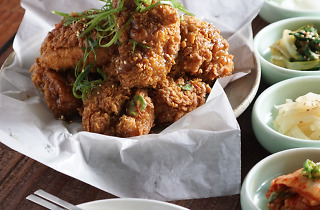 The chicken wings ($88), basted in the eatery’s bespoke sweet and spicy sauce, are perfect. The skin is crisp and each bite is interspersed with a trifecta of sauce, crunch and tender chicken. We thoroughly enjoy this. Bigger plates on the menu include the cheese nakji ($258) where baby octopus is marinated in a Sichuan chimichurri and served in a large pan with an outer rim filled with mozzarella heated over a gas stove tableside. The morsels of octopus are ideal for scooping up the gooey cheese and though it’s a race to finish this dish before the cheese becomes burnt, it’s tasty all the same and we hope to see different variations such as chicken or pork on the menu soon. 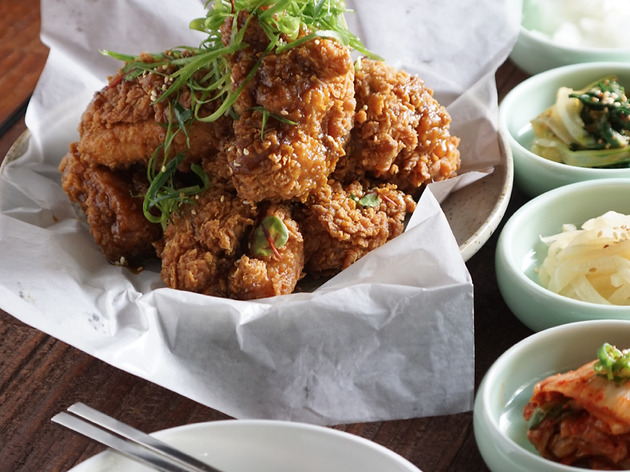 The star of the evening arrives in the form of a mountain of Korean fried chicken ($198). The buttery batter on the outside emits wafts of fragrant curry and the crumbly exterior gives way to juicy tender chicken on the inside. This is it. The creative coup de grâce from the Demon Chef that we’ve been waiting for. And it’s magnificent. 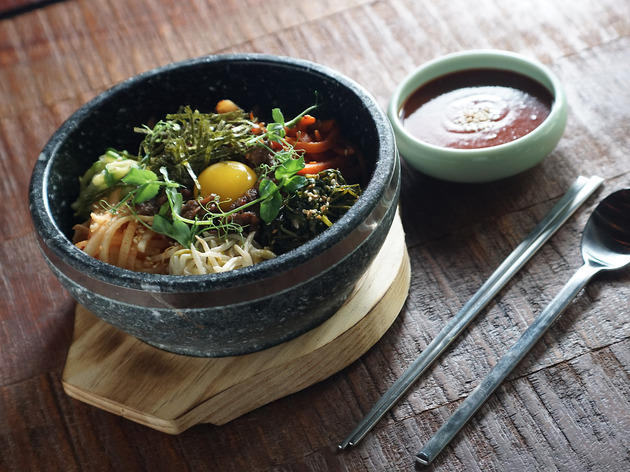 We top off this portion of the meal with a bulgogi bibimbap ($128) and though it’s not the most inventive dish of its kind on the menu, it provides comfort and the use of pickled cucumbers is interesting on the palate. The eatery is so new that the desserts aren’t finalised yet, but we’re told there’s a makgeolli tiramisu ($78) we should try. Layered with barley and garnished with an Asian date, we feel this sweet treat needs a little more work. We enjoy the subtle notes of rice and wheat wine in the mascarpone but there needs to a stronger component – such as coffee in a standard tiramisu – to anchor the flavours. Bib N Hops does play with some interesting twists on Korean classics but coming from the man who turned Chinese preserved meats into an ice cream, the minor deviations here and there feel uncharacteristically timid. Some recipes need work but on the whole it’s a very enjoyable meal. It’s not an exhilarating rollercoaster ride of culinary reinvention. More a pleasant ride in the park, safety helmet and all.